You are here: Home » Blog » Science & Engineering » What Caused These Mysterious Ice Holes In The Arctic? 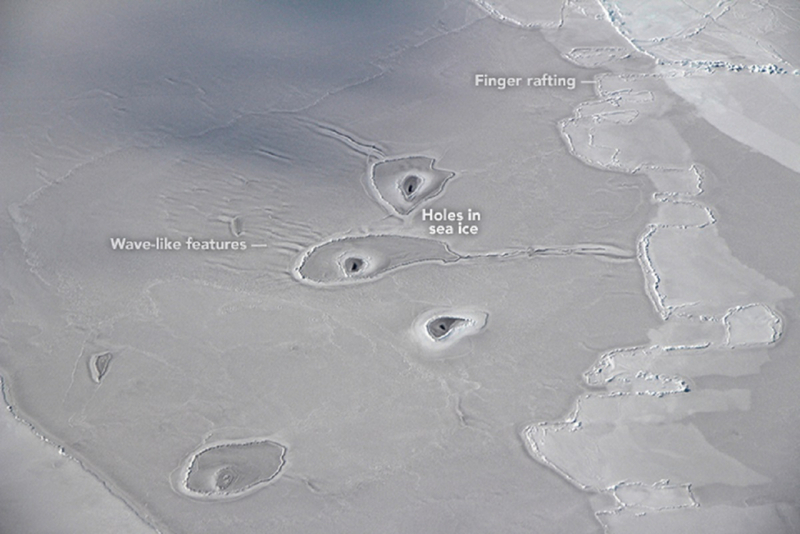 Recent sightings of three mysterious holes in Arctic sea ice have NASA scientists puzzled. During yearly flights over the polar regions, holes in the ice were discovered while flying in a P-3 research plane over the eastern Beaufort Sea, which is an area of the Arctic Ocean just north of eastern Alaska and northwestern Canada. NASA’s Operation IceBridge, now in its tenth year, makes yearly flights over the Arctic and Antarctic to map the land ice and sea ice over the regions. John Sonntag, scientist for the April 14, 2018 mapping mission, snapped photographs of something he hadn’t seen before. “We saw these sort of ‘circular’ features only for a few minutes today,” Sonntag reported during the mission, according to NASA. They are only considered a curiosity at this point, but the image of the three holes together has sparked speculation as to their origin.